Review published in IJPE, Vol. 8, No. 4 , July 2013, p. 426. There are several models that are common to reliability and risk analysis. Professor Todinov has done a good work of bringing out a book on these aspects in the form of a book published by Wiley in 2005. After presenting the basic concepts of reliability in chapter 1, the author presents in chapter 2, several distributions such as binomial. Poisson’s and negative exponential distributions etc., that are common to the reliability and risk analyses. In the next chapter, the author presents the model with mixture of distributions as the items may come from different sources abide different distributions and subsequently shows how to build reliability and risk models from data. Next the author presents load and strength models and how they can be solved using Monte Carlo method if analytical solution cannot be obtained straight away. He also propagates the use of Monte Carlo method in case inhomogeneity and thus allowing resolution of the material structural problems in reliability and risk assessment. The chapter on mechanisms of failures adds to the usefulness of the book. Some of the useful propositions on modelling of practical problems such as multi-run welds will be found useful. Another important characteristic of reliability and risk modelling is the uncertainties associated with data, and models themselves. This book deals with them at great length and should be found useful by the readers. Subsequent chapters deal with some of the problems that an analyst finds while dealing with practical problems. 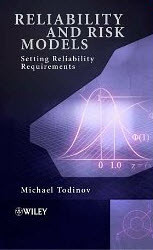 Along with classical reliability models, the book also covers a number of new, little-known reliability models. For example, the model related to existence of a minimum time interval between random failures of repairable systems, the model related to the largest possible variance from sampling properties from multiple sources and the model related to reliability dependent on random configurations. The book also supplies the pseudo-code of algorithms for reliability analyses and setting quantitative reliability requirements. In short, the reviewer recommends this book to anyone who is dealing with the problem of reliability and risk modelling of practical systems. The book also will be found helpful by the students and teachers who would like to comprehend various aspects of reliability and risk modelling. Review published in the International Journal of Performability Engineering, Vol. 8, No. 4, July 2012 issue, p.426.